A reminder for all ATTS members: The perfection of a planned trade ends as soon as you take the trade and your control over the outcome ends. You can control where to place profit targets and stop losses but what happens with the price action is outside your control. With every trade there is a risk of loss and the objective is to minimize the loss when if takes place. On every trade be aware of the risk, and if you are not willing to accept that risk then do not take the trade. Remember that even a system that generates winning trades 60% of the time will over time also have 40% losing trades. This is one of the reasons I split my trades into both an Income Generating part and a Capital Growth part. Even if I do not need the cashflow, I take some profit off the table with the Income Generating portion which in turn reduces my cost basis on the remaining shares. This in turn provides a bit more breathing room for the remaining shares when prices do pull back. Remember, once the trade has been made one of three things will happen—prices will go up, price will go sideways or prices will go down. We assess and reassess our plan to maximize gains and minimize loses. But we accept that we are not in control of what actually happens. The price action the Market provides is what is in control, over that we are absolutely powerless! What can our Premium & Early Warning Alert members expect going forward? Trade set up alerts either the evening before the next trading day or early in the morning prior to the beginning of trading. Of course there will be times when alerts will be coming out during the day depending on market conditions. Secondly, I want to provide Market Updates between 11 and 12 noon Pacific Time. These will be a mix of both written and video updates. If there is action that is required I will highlight that action in the body of the email containing the link for the Video Update. General Market Observation: After two full weeks of trading in 2015 it is becoming apparent currently this is a “base hit” market. With the volatile nature of price action over the past two weeks, quick profits with tight stops trading between levels of support and resistance has been the characteristic of the Indexes. So is the personality and character of the Indexes changing from what they’ve been over the past 3 years? Will we continue to see short and shallow pullbacks followed by healthy runs to the upside? Are the wheels coming off the Global Economy? Will we learn anything from the World Economic Forum taking place this week in Switzerland? At this point there seems to be a lot of questions and price action has not provided clear answer, yet! So what are we as traders to do? First we must be very disciplined and strategic in our approach if we choose to be in the market. Taking bullish trades at well-defined support and closing at least a portion of those trades at well-defined resistance is one way to bring in some profit while waiting for directional stability. Of course stepping back and just waiting is another course of action that will provide both protection and the necessary capital when it is time to move into positions. Regarding the question, about the changing personality and character of the Market, it would seem that it does appear that these factors are changing as price action has become wider and looser over the past few months and not following the same orderly progression we’ve observed earlier in the Bull Market Run. This is not surprising considering how long the Bull Market has been in place. Many analysts agree that a 15-25% correction would be healthy—but painful. At some point the “buy the dip” strategy will fail, and then we will be surer of the Market change. SPX: On Friday the S&P bounced at the support zone around 1990. The indicators between the daily and weekly charts continue to be divergent the weekly charts appearing to favor more selling while the daily chart appearing to favor at least a Relief Rally. If the 1990 level fails then the probability of a more significant correction increases and other support levels come into play including the 200 day SMA. A relief rally may take price back to the 2035 zone. NDX: The Nasdaq 100 has not put in a lower high and broken support from the swing low of Jan 6th. The 20 day has now provided a bearish cross of the 50 day so these moving averages now become levels of resistance. Friday’s price action bounced back above the 4124 level which was a breakout level in late October 2014. If prices continue to roll over then support around 4000 will come into play which coincides with the uptrend channel line base. Like the last to corrections in the NDX current price action is becoming more disorderly with bigger swings. Short term the trend is down but the longer term trend remains up. Viable trades would be at either support or resistance. RUT: Range bound with big moves. Price rebounded Friday from just above the 200 day SMA. While there are tradable moves in the Index ETFs representing the Russell, the trade set ups are not the most advantageous for traders looking for a long run. A trader can plan a trade at support and then sell at least a portion of the position at resistance—the next day! To trade this way a trader must be very good at using Conditional Orders and keep tight stops just in case sellers come in and start taking price below objective levels of support. The range and scale on TNA is impressive for those looking for quick trades, but again wait for the support and resistance bounced! Over all we believe either the Index ETFs for the Russell (IWM or TNA) or the NDX (QQQ or TQQQ) will provide better trading opportunities than the SPX ETFs. The Margin Account us invested at 2.7% currently. IBD show the Market in Confirmed Uptrend, but I’m seeing a mixed Market that could go either way in the short term. It will continue to be a market of stocks for the patient trader. Outs & Ins: Big swings in the Outs & Ins this weekend. 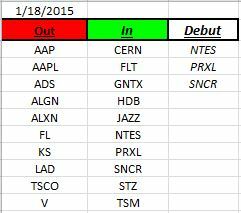 NTES, PRXL and SNCR make their debut appearance on the list but all have been on IBD 50 list in the past. NTES just broke to a new high on increasing volume. PRXL has a poor pattern. SNCR looks interesting as it bases at the 200 day moving average. Keep an eye on both CAR and NOAH as they work on hammering out a consolidation pattern. Over the next 3 weeks 27 of the current ID 50 will report earnings, so this may provide some fireworks and movement on the list! Off the Wall: If Dr. Martin Luther King Jr was still alive today what would he think about where the US is as a country? While his presence in the history of our country was short, the positive impacts of his words continue to be a beacon of truth and freedom. While I think that some have taken his message and twisted it and made it what it was never intended to be, the truth within his words provide a wonderful light shining towards what we can become. It is almost ironic that those who opposed him the greatest are now the ones who embrace his words but not to promote freedom. They promote a poisoned agenda that would have more and more citizens become beholden to Big Government. This entitlement mentality runs rampant and keeps many from ever achieving “The Dream”!